CLICK HERE to print a SHOT RECORD FORM. Faith Livestock would like to introduce, Dr Rett Scoggin as our attending veterinarian. Feel free to introduce yourself to Dr Scoggin or contact us if you have any questions. Dr. Rett Scoggin is a graduate of Colorado State University. Rett was born in Belle Fourche, SD, and raised on his family’s ranch south of Alzada, MT. Rett's wife, Abbra, and their daughter, Jaylea, live in Belle Fourche. Dr. Scoggin and his crew will be able to work your livestock before or after the sale. 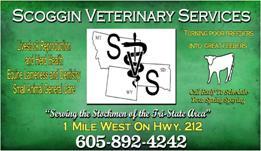 They provide a full-line veterinary services and supplies as well as heifer spaying.
. Give him a call at 605-892-4242.